February | 2013 | Meet a LinkBuilder and Learn Everything about SEO! More persuasive content. With the use of an infographi c, you can easily impart your information to the readers in a way that is easier to scan and remember. Viewing a graphical version of your content is simpler to understand than reading the text version of it. More viral. In digital marketing, if you want to be visible globally against millions of competitors, aim to be viral. Infographics are fun. They are attention grabbing. As people love looking at attractive contents, most of them tend to share to their website or friends in Facebook and Pinterest. As such, it has a huge capability to be viral. Increases traffic. They are embeddable. An embed code is usually added at the bottom of an infographic. This piece of code contains a link to your website so it’s faster for the readers to find you. SEO-wise, as more websites embed your infographic, your inbound links go along with it. This means more links going back to your site, larger number of visits, higher web traffic. Establishes brand. A well-designed infographic usually shows the creator’s details. As they go viral, so does the name of your brand. Hence, if you’re an SEO company in the Philippines, creating viral infographics can be a good way to be seen out there. It can make people aware of the quality services you offer. On the next post, learn the essential steps on how to design an effective infographic. Nowadays, almost every business, celebrity, and even private individuals have their own websites. These websites allow a wide range of business, from the smallest to the biggest, to promote their products or services. However, the purpose of a website is not always fulfilled for the company or individual that it represents. For a website to be successful, it has to be well designed, optimized for search engines, and has a high social media presence. Many websites are handled by SEO companies in the Philippines for all of these needs. While there are numerous SEO and SMO strategies that are done when the website already exists, the web design concept has a significant effect on how successful a website will be. Below are some reasons why you should put a lot of serious thought and planning on your website’s design. First impressions last. Your website is your or your company’s online visual to your target market. What they see immediately upon loading your website’s home page will largely affect how they view your company. So it is very important that your website’s design accurately reflects the company’s personality. Even if you hire a web design company in the Philippines, make sure that you are involved in designing your website. Bridge to your audience. Since your website is your vehicle towards reaching your target audience, how you design it affects how effectively you can reach out to your visitors. Important information should be easily available and the entire website should be easy to navigate. If the visual web design of your home page makes the first impression on your target audience, your site’s navigation should mirror the customer service that you aim to provide. Affects SEO. Search engine optimization is not just about building links to your website. It also means designing your website in such a way that search engine spiders will find it easy to crawl. This means that targeted keywords should be incorporated and well-placed in the home page text. There are many different strategies used by SEO Philippines companiesto help increase a website’s search engine rankings and visibility. One of these strategies is by using a link wheel. 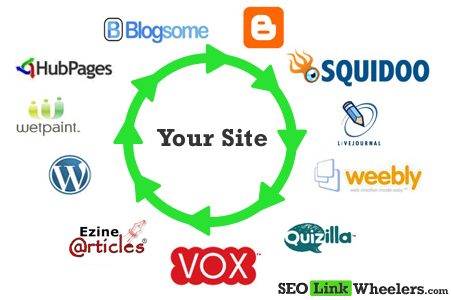 A link wheel is a strategy wherein different web 2.0 sites create a path linking to each other. The end goal is to link to the website which you are aiming to promote. Just like when you are link building, another popular SEO strategy, it is most beneficial if your link wheel involves good websites with high search engine rankings and quality content. Making a link wheel does not require hiring an SEO in manila company. It is possible to make a link wheel on your own. Below is a quick guide to help you build a link wheel. Determine your keywords. The first step is to determine the keywords that you want to use. Consequently, these will determine how your pages will link together. Choose your web 2.0 sites. Decide on how many pages or websites will be in your link wheel. Afterwards, choose the web 2.0 sites where you will post your content. Some good websites that you can choose from are Blogger, WordPress, Squidoo, Blog.com, Tumbler, and LiveJournal, among others. Create good quality content. It is very important to have good quality content to hold the links to your link wheel. The trick is in placing the keywords seamlessly into your content. Plan how each article will link to your main website and to another website in your link wheel. Each article should have a keyword linking to the website you are promoting and another keyword linking to another web 2.0 site. Post your content. After you have written all the articles, post your content in each web 2.0 site. There is no limit to the number of websites you want to include in your link wheel. Just make sure that all links are good and working fine.